We don’t have to tell you it’s hot in the summer around Phoenix. Plants often need more water during peak heat, and trees are no exception. But it’s not just about air temperature when it comes to tree health – our unique Valley climate affects when and how much water trees need. So here are a few summer watering tips for Phoenix-area homeowners. In Phoenix, summers heat up toward the middle of the summer season, but the air also is more humid in July and August (especially after a good monsoon rain). Humidity might make you feel hotter but it can also slow a tree’s evapotranspiration. That’s the name for the loss of water through evaporation (from the soil) and transpiration, the process that carries water from a tree’s roots to its branches, leaves, and finally into the air through tiny pores on the underside of the leaves. So, cut back a little on watering when it’s humid (even if the air is hot). Here in the Anthem and Phoenix area, we have mostly clay soils, which dry more slowly than sandier soils. This means you should water your trees less often but more deeply. Drip irrigation that circles the root zone works best. The root zone is further out than the tree’s canopy so be sure to set your drip hoses far enough away from the tree trunk. If you water with a hose, set the hose to a low pressure and move it around the tree as often as possible so roots on all sides of the tree get enough water (and no one section gets overwatered). If you overwater and oversaturate our clay soil, roots will get too little oxygen and the tree will suffer. You may notice new growth dying, leaves turning pale green or yellow, and fragile stems. Plus, when soil is too wet, a strong summer wind can cause the tree to uproot and topple over onto your car, house or even people! Choose the Right Times of Day to Water. On summer’s hottest and driest days, water evaporates more quickly, which wastes water and dries the soil faster. Don’t wait to water a tree until it’s 108 degrees or when you see wilting leaves. Try to plan ahead and give your tree a nice long soak in the evening or as soon as you wake up in the morning, before blazing heat and winds start for the day. Set a timer if you can, to automatically water your tree before you get up in the morning. Or at least use a phone or other alert to help you remember to turn the hose on when you get up and off before heading out to work. Young trees need more frequent watering in the first year or two. Plus, if a tree is flowering or fruiting, it might also need more water for a few weeks. And heat is not the only weather factor to consider. A week of high winds and low humidity dries trees out much faster than a week of clouds and humidity. If rain is in the forecast, adjust your regular watering schedule to avoid wasting water or overwating your trees. The best way to ensure you water trees enough – and not too much – in summer is to spend time enjoying your trees. When you walk past them or sit in their shade, you’ll notice possible signs of water stress (such as wilting or curling leaves) and overwatering (wilted tips on new shoots or soft tree tissue). Take note of any changes and modify your watering schedule as needed. Looking to get an inspection for tree service? 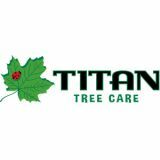 Contact Titan Tree Care today.